So first off, let me assure that slamming my head against the wall, crunching paper into tight, angry balls and watching them pile up, and just dropping my weary head to the page do not work. The paper is silent, the pen dry. Prioritize. There are so many ideas cluttering the crevices in my mind, that none of them get air time. I find when I’m all cramped up like this I make lists. I start with groceries because that is easy. From there I expand into vacation spots, and trees (I know, but I have a thing for trees- they’re majestic and tall and curved with stories- but that’s for another post.) Which writing tasks do I need to accomplish first today? An outline, a random paragraph, perhaps some character development? When all else fails, that new medium for writers, social media, can grab a little time in the spotlight. There is always an inspiring picture for Pinterest, a quote I love to post on my Facebook page, or just simply checking my e-mail for writing tips from others. Sometimes a spammy ad in my inbox turns on the light and wake up my little monsters, and the voices start, the pen flies across the page,( unless you favor a keyboard) and Voila! no more writer’s block. Next, I create some goals. I usually set mine up for the week, penning them into my calendar, but often, they need daily re-vamping. Writers need to be flexible, because you never know what opportunities present themselves. After all, writer’s block occurs mostly from our own self criticism. Sometimes I am so hard on myself that all thoughts are blocked and cannot move from the mind to the pen. (I’m old school first.) Most writers are a fickle bunch. It is imperative to have a goal, because otherwise let’s face it, we would be clicking on pins and quote all day. I never list my goals as simply “write” or “story edit.” It is far less daunting and more attainable if my calendar is broken into smaller, more do-able tasks. For example ; write a paragraph for current story, outline blog post, post to Facebook page, pin my last blog, etc.I also schedule myself time away from the pen and keyboard. A walk, coffee, meditation, lunch with a friend – these help keep the ideas fresh and flowing and the inner demons talking. It is also important to remember my focus and my purpose. When I really get stuck, I try and remember why I write. I write to express myself, to share with and motivate others, to make people feel something, to educate (for other writers and bloggers? ), and to let those demons have their say. All of this is both cathartic and rewarding, especially if you get published. Another important thing to remember is that I am human and fallible. Some days will be truly unproductive, and I won’t meet any of my goals. And that’s OK. Sometimes we all need to stop, recharge and reboot.It is not an excuse for lack of productivity, but a brain boost. (See Play Hooky Like A Pro). This next trick is MEGA important. Step outside and live your life. The random bike ride, self talk while on a quiet walk, adventures with friends and family – these are your stories. All writers are wired to see the world a little differently. We see in words and phrases and worry about the endings. We see stories everywhere we go. And yes, if you do something to inspire, anger or humor me, you might be part of a story. Call it my disclaimer, but I will never publish your name. Promise. Stepping outside my routine changes everything – there are more stories, more writing. Sometimes, I write for my eyes only – and that is alright too, as long as the words keep coming. Last, but certainly not least, is to reward yourself. Break up daily tasks and goals and give yourself a pat on the back, a snack, a power nap (my current favorite) after you complete your goals. Any kind of incentive, (coffee, chocolate, a walk) that helps you complete your tasks make a pretty good chance of those imaginary friends opening up and starting to talk again. Then, with the incentive in sight, your words just might flow out a little faster. I am a writer, as are some of you dear reader and friends. 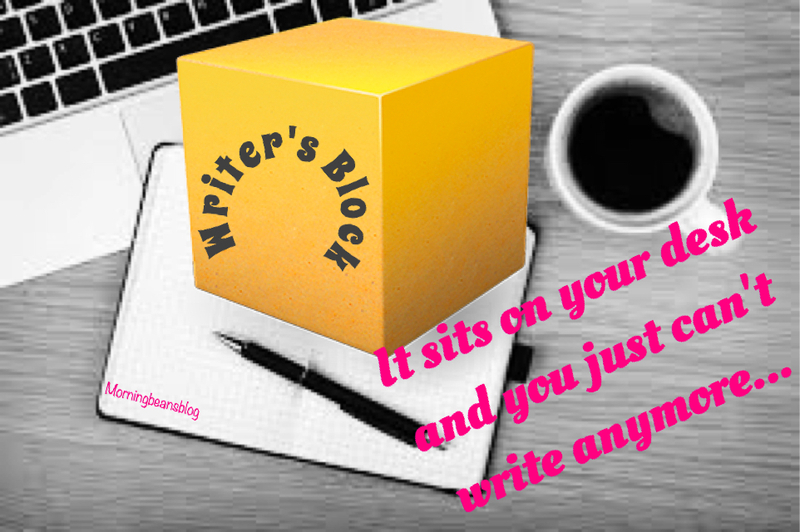 Writer’s block is so common for all of us. What are some of the ways you use to break free and get the words flowing? Share in the comment section – we can uplift each other and write on!